This is an application that was written for a customer who wanted to see what broadcast transmitters were nearby. 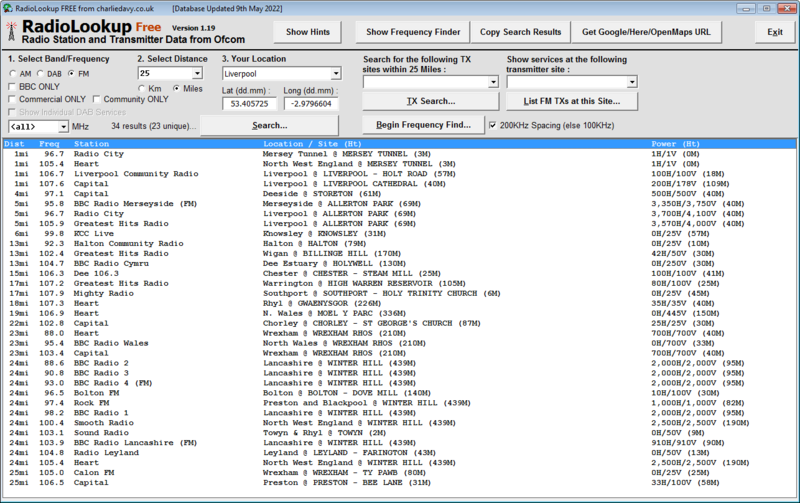 Ofcom produce a resource known as TXParams which offers AM, DAB and FM transmitter data (location, ERP, RDS and such). Their CSV files allow for easy handling of this information making a database (or map) quite straightforward – if you put in the coding effort! My solution allows you to specify a frequency (or “all”) and select a range – you are then offered a list of matching transmitters/stations in order of distance from your location. Uses include: Identify a potential frequency for a new service (like a Community Radio Station) or simply to find out what stations are nearby and what services you can get from a nearby DAB multiplex. An option allows you to filter for nearby Community stations. You can also find for a specific service within a set distance, eg: Find all BBC Radio 1 transmitters within 100 miles and so on. This was a quick ‘n’ dirty build and would work much better in a browser using PHP, MySQL and a mapping interface (such as OpenStreetMaps) – as, at the time, I couldn’t find an existing solution (although there is now a map version available here) that offered the data in a “human readable” form. Results offered included: Distance, Frequency, Station/Service, Location/Site and In-Use ERP. Additional features available to the client included an ERP filter plus a “clear frequency search” offering potential “gaps” on the FM band. This works via the location+range filter plus removing frequencies +/-200KHz either side of the “offending” service – a very non-scientific method but provides a general idea of how cluttered the band is! This basic version is FREE and can be used as often as you like. Over 50 pre-set locations are included, but up to 100 can be defined. You can run the latest installer “over the top” of an existing one without losing your location presets, it’ll just update the OFCOM database. Find Available Frequencies and List TXs at this Site are only available in the registered version. To register your copy, a one-off payment of £5 is required. Click here to make a £5 payment via Nochex.